Are you a mobile phone addict? I sometimes feel that I’m the only person on the planet who isn’t permanently glued to my mobile. When I go walking and come across someone at over 3000 feet, sitting at a trig point and talking into their mobile instead of admiring the view, I feel like taking it off them and throwing it over the nearest rock face (and that’s the censored suggestion). So, as you can imagine, I’m not really into ‘apps’ but I saw an intriguing one last week – findatoilet.mobi. All you do is type in where you are and you’ll be told the location of the nearest public convenience. That’s OK if you’re in central Manchester, but you might not make it in time if you’re half way up Snowdon! I wonder if they suggest bushes or stone walls as alternatives? We hear a lot these days about writers blogging or putting extracts of their work on the Internet and then getting spotted by a publisher or agent and taken on. How often does it really happen and what are your chances? I can’t answer that one but apparently crime writer Stuart Neville was discovered by his agent after he had posted a short story on Thuglit. In fact, his debut novel ‘The Twelve’, published by Harvill Secker is out now and has had some great reviews. Or, if you’re an aspiring novelist but Thuglit isn’t your style, why not have a look at Authonomy? Launched by HarperCollins, this site allows you to upload your novel and have it read – and judged – by fellow members. It’s already highlighted some success stories and the best are currently being printed. And finally, don’t forget the Writers Bureau 21st Birthday Caption Writing competition. You’ve just time to enter before the closing date of 30th May, giving you the chance to win a Freelance Journalism course. Enjoy your writing over the bank holiday weekend! New Course from Writers Bureau on marketing your book successfully! First, thanks to Lorraine for last week’s blog. She’s currently writing a course for The Writers Bureau on the best way to promote and sell your book. As you’d expect from Lorraine, the tone is light and humorous but it’s still packed with useful information – I’ll let you know as soon as it’s available. The weekend in Yorkshire was great and the Himalayan Garden near Grewelthorpe was well worth a visit. 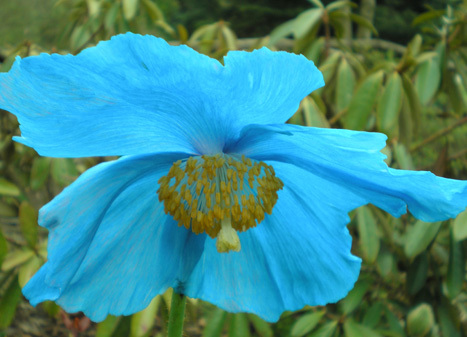 I’ve included my picture of Meconopsis betonicifolia (Himalayan blue poppy to you and me) – the only photo I managed to take before my camera batteries died. And yes, you’ve guessed it, when I put the spares in they were flat too! So back to work, and as our own writing competition is in full swing I tend to keep my eye on what is going on elsewhere. Last week I noticed the Guardian Weekend short story competition where you can win the chance to have your story published in the Guardian Weekend’s annual summer fiction issue in August. They are looking for stories up to 2000 words in length on a summer theme and entries have to be in by 18th June. The best story will be published in the magazine and five runners-up will appear on Guardian Books I’m sure the competition will be fierce, but entry is free and the kudos of winning will be immense. Check out the earlier link for full details and rules of entry. As I mentioned, the maximum length for this, like ours, is 2000 words. But I’ve noticed an increasing number of competitions for ‘flash’ fiction – anything from 50 to 250 words. Is it something to do with our increasingly busy lives or just a reduction in attention span? At first glance it might seem easier than sitting down and wiring 2-3000 words, but that’s not always the case. You’ve got to be pretty good to write something that really has meaning and grips the reader in so few words. It needs a great deal of thought and polishing to carry it off successfully. Give me a more traditional length any day! Comments Off on New Course from Writers Bureau on marketing your book successfully! This month it’s my turn to guest post here on the Writers Bureau blog. I pondered for quite a while over what to write, but then I realised in these financially uncertain times, one thing we are all interested in is making as much money as we can from our writing. I have a golden rule with regard to my articles and it’s this: if I only sell something once, then I need to try harder because that simply isn’t good enough. Let me explain what I mean by this. I have just sold a humour article for reprint rights in the UK. Although I only received fifty percent of what the original fee was when the piece was first published (way back in 2005), I am still thrilled to bits. The reason for my glee is that this is the fourth time I’ve sold this particular article. It was originally published in the UK as part of a series of humour pieces I wrote for a regular column. I subsequently sold First North American Serial Rights to a magazine in the US and First Australian and New Zealand Rights to an Australian magazine. Now, three years since it last appeared in print, it’s being published again in the UK under Second British Serial Rights. My reason for sharing this with you is to remind you of the benefits of recycling your work. If something is good enough to be accepted for publication in one country, it is entirely possible that an editor in another country might like it too. Even though you will most probably need to make some changes for the magazine’s style and tone in each country, that would still involve far less work than writing a completely new article. Obviously, you should be aiming at magazines and newspapers in your country of residence first, but once something has been published there, you should consider selling it again and again. So how do you find markets in other countries? First and foremost, subscribe to magazines which give details of available markets, such as Freelance Market News. You might also find the following websites of benefit, but they do require registration and payment of a small fee to access the information. However, one resale of an article or short story would more than cover the cost. Next, make sure you research your overseas titles as carefully as you would your home publications. Many editors are happy to supply sample issues to prospective contributors via a PDF version as an e-mail attachment. If that isn’t possible, most magazines now have websites where a selection of previously published material can be studied. Good luck and happy reselling. Win a Writers Bureau Freelance Journalism Course! I’m sure that like me you’re all thankful that Election Day is finally upon us and the whole thing will soon be over – for better or for worse. And being the pessimist that I am, I suspect that no matter who gets in it will be for the worse…for most of us. Oscar Wilde said “A little sincerity is a dangerous thing, and a great deal of it is absolutely fatal”. That being the case, I don’t think our current raft of politicians have much to worry about! I got that quote from the Brainy Quote site, and must confess to having wasted a bit of time this morning trawling round and looking for other good quotes. It’s easy to use – you can search by subject or by person, there’s a ‘quote of the day’ and lots of other quirky info. And on the subject of ‘quirky’ why not enter this month’s 21st Birthday Competition? All you have to do is provide a witty or amusing caption to a photo on our website and you can win a Writers Bureau Freelance Journalism Course. This weekend I’m off to visit The Himalayan Garden and Sculpture Park in Grewelthorpe, North Yorkshire. Don’t you just love the name Grewelthorpe? It rolls off the tongue and conjures up visions of Dickensian schools, or corner shops staffed by the likes of Ronnie Barker in ‘Open All Hours’. No offence to the residents – I bet in reality it’s picture-postcard perfect. But all will be revealed on Saturday! Next week, you’re having a break from me. 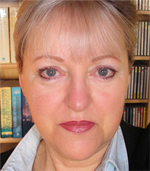 My guest blogger is Lorraine Mace, Writers Bureau tutor and writer of many talents. She’ll be telling you how to sell work time and time again to make as much money as possible from it. In the meantime, you can watch her talking about her humorous writing by visiting the Writers Bureau website. Comments Off on Win a Writers Bureau Freelance Journalism Course!